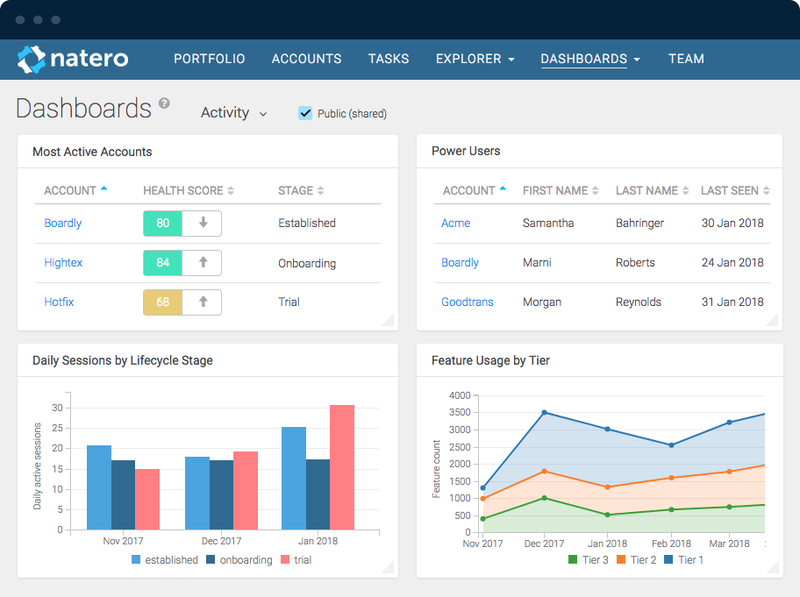 Natero Review: "Customer success made easy"
Natero allows VividCortex to see a complete view of customer health, allowing account managers, success managers, and support to intervene before problems occur and ensure our users get the maximum value from our own productivity. The same data enables engineering and product management to make intelligent data based decisions, improving and optimizing our application. Customer Success - If you want to measure your customers success and your own efforts to improve it, Natero gives you all the data necessary to build a data driven success operation. Natero is especially well suited to products which have a medium touch rate where blending behavioral data from click tracking and relationship data such as email, chat and phone call can be combined to create a bespoke portrait of the customer is appropriate. Situations such as massive mobile application deployment to near anonymous users would be better using something else. 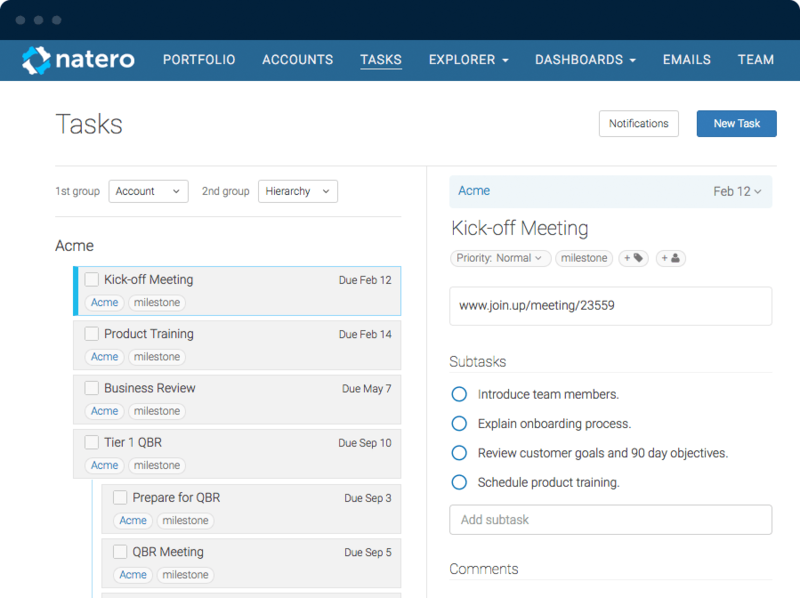 Natero Review: "It could be better"
Natero is currently being used within my customer success department at a software as a service company. It is not being used at the whole organization. It is addressing our health check of our customers and providing the latest updates to all of our companies. We go in it once a week. Allows me to make changes in one view. Allows me view multiple information. Allows me to read information quickly. The reporting functionality could be better. There is not that much customization available. It takes multiple clicks to be able to view the information. Natero is great if you want to see a list of your customers if you are not familiar or do not have access to software like Salesforce. It provides you a quick snapshot of your customer's health. It also has some cool charts and graphs. It's not suited for heavy customization. Review: "Natero has many benefits, but may not be the best project management solution"
We utilize Natero in the customer success department in for CSMs to see the health of their accounts and provide status updates to leadership and CSMs set up accounts, which are assigned in SFDC, to link to relevant documentation and create project plans. We also leverage the charting that's available for enhancing business reviews for customers. Love the accounts view to see all my accounts, their health and some helpful stats! The charting is relevant and detailed for customers to understand their usage of our product. The look and feel is very clean and easy to understand. In the account, you can link to other documentation, which is great! Workflows are easy to set up, however, there is not a good visual, like a Gantt chart. This would help everyone see the status more clearly. When you go into an account, it's hard to go back to the page you were on previously. My dashboard does not provide particularly helpful information. SFDC cannot be updated via Natero. So I have to make updates in multiple places. This is the biggest gripe I have with Natero. Natero is great for businesses that need to view the health and status of 5-20 accounts. You can certainly see more, however, it's paginated, which makes it more cumbersome. And harder to see in a snapshot. Natero is not as well suited for businesses that need to view the health of over 20 accounts. Nor if they have a heavy focus on project management and visuals for workflows. Review: "Weaknesses to Strengths - the Natero way !!" It was being used by the department initially as it was on a test run basis. Problem wise Natero aims to empower customer success in terms of predicting churns, expected sales, and in relation to marketing teams to become data-driven, without having to rely on data experts. It automatically aggregates and mines all sources of customer data to uncover actionable insights which is a very useful feature. On the whole I would say a very decent service that helps with data analysis It is streamlined in such a manner and with a friendly user interface so that it is easy to understand data without any complications at all. Delivering a positive customer experience allows companies to differentiate themselves and stay competitive. So to stay well-suited I would want to see constant new changes and updates in terms of interface, services etc. 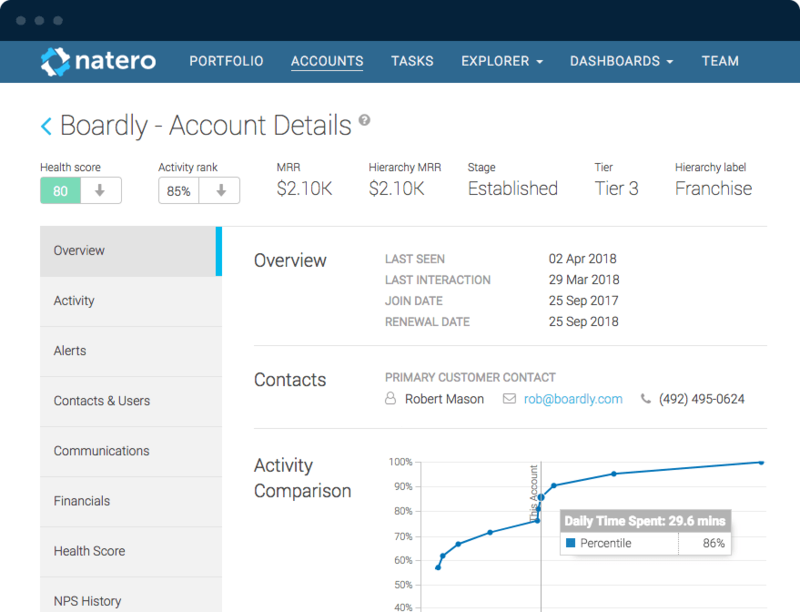 Natero is designed to help Customer Success Managers prevent churn, increase account expansion, and manage more customers with less effort. Customer 360 - See customer emails, chats, meetings, support tickets, billing history, and product usage — all in one place. Predictive Alerts - Predict which customers are likely to churn, convert, or expand their business with you. Health Scores - Monitor customer health based on in-app usage, custom KPIs, CSM scores, support tickets, NPS, and more. Workflows & Playbooks - Drive your Customer Success processes for Onboarding, Business Reviews, Risk Mitigation, Renewals and more. Targeted Emails - Send timely and relevant emails to the right customers using automatic triggers or segmented lists. 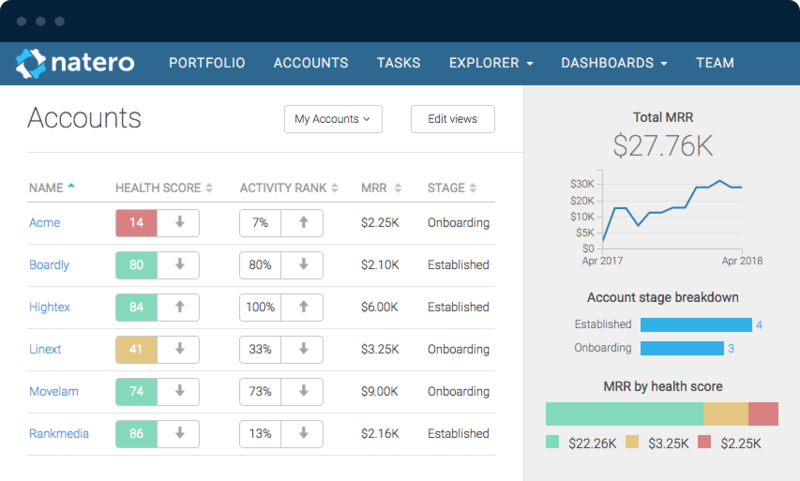 Dashboards - See critical metrics like Churn, Lifetime Value (LTV), product adoption, financial health or create your own custom views. Reporting - Explore all of your customer data and spot trends over time using a point-and-click report builder. Segmentation - Create dynamic lists of accounts and users for in-depth analysis, comparison, or customer outreach. Natero combines predictive analytics, customer intelligence, and workflow management in a unified platform. The vendor says this data-driven approach enables B2B software providers to proactively manage Customer Success and maximize customer lifetime value.